History: An 11 year-old, spayed female Labrador retriever presents for polyuria and polydipsia. The owners report mild lethargy but the dog is otherwise doing well. Physical examination reveals body condition 4/9 but is otherwise within normal limits for a dog of this age. A complete blood count is within normal limits. The chemistry profile reveals total calcium 15.4 mg/dl (NR, 9.4-11.8), ionized calcium 1.7 mmol/L (NR, 1.12-1.40), creatinine 2.1 mg/dl (NR, 0.6-2.0), BUN 39 mg/dl (NR, 8-30). Urinalysis reveals dilute urine with a specific gravity of 1.008. Thoracic radiographs are taken (Figure 1) and an ultrasound-guided fine needle aspiration is performed.. Figure 1: Lateral thoracic radiograph demonstrating cranial mediastinal mass. What are the differential diagnoses for this lesion? Figure 2: Cytology of cranial mediastinal mass. Green arrows point to mast cells. What is your diagnosis? 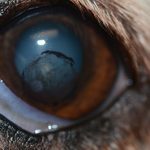 How would you treat this dog? The most common differential diagnoses for a cranial mediastinal mass in an aged dog include cranial mediastinal lymphoma, thymoma and ectopic thyroid carcinoma – all of which can cause hypercalcemia. Since the mass is clearly distinct from the base of the heart, right atrial hemangiosarcoma and chemodectoma (carotid or aortic body tumors) are less likely. The fine needle aspirate cytology reveals a mixed population of lymphocytes with a few mast cells. The lymphocyte population is a mixture of small and medium forms. This cytology is most consistent with thymoma. Aspirates of thymoma may also contain other inflammatory cells, such as macrophages, usually in low numbers. Although the malignant cells in thymoma are epilethlial, they often are not seen on fine needle aspirates. Consequently, biopsy is needed to confirm the diagnosis. 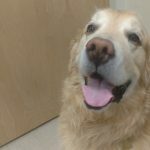 This dog underwent surgery via median sternotomy to remove the mediastinal mass. Excision was complete. The diagnosis was confirmed via histopathology. The biopsy reveals large numbers of lymphocytes admixed with epithelial cells (Figure 3). In cases of lymphocyte-rich thymoma, epithelial cells may be difficult to distinguish, but readily stain positive for cytokeratin (Figure 4). 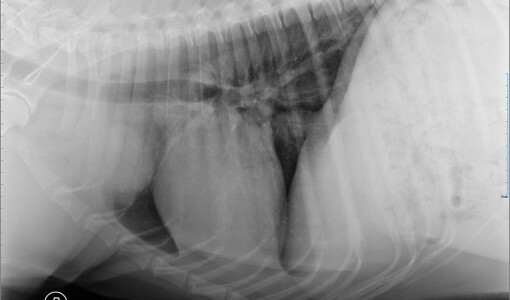 This thymoma was non-invasive, which occurs in approximately half of canine cases. The prognosis is good for canine thymoma with reported 1- and 3-year survival rates of 64 and 42%, respectively, overall.1 For the noninvasive form, survival rates are higher, with many dogs dying of other causes. When complete surgical excision is not feasible, such as with invasive forms, radiation therapy is indicated as up to three-quarters of tumors will respond to radiation. Chemotherapy typically is reserved for recurrent disease or tumors with more aggressive histologic appearance, and its efficacy is not well established. For small tumors, clinical signs may be absent. However, exercise intolerance, coughing, dyspnea, or dysphagia may occur with larger tumors, particularly if pleural effusion is present. Hypercalcemia, hypoglobulinemia, and aplastic anemia have been reported to be associated with thymoma. A notable paraneoplastic syndrome with this tumor is myasthenia gravis, which may occur in up to 40% of dogs. The presence of myasthenia gravis, particularly if accompanied by megaesophagus, is a poor prognostic indicator. These dogs are at increased risk of aspiration pneumonia following anesthesia. Resolution of paraneoplastic syndromes often occur after surgery. Consequently, prolonged treatment for myasthenia gravis may be required. In the case described here, the dog recovered uneventfully from surgery. The hypercalcemia resolved and renal values normalized. She remains alive more than one year following treatment. Results of excision of thymoma in cats and dogs: 20 cases (1984-2005). J Am Vet Med Assoc 232:1186-1192, 2008. 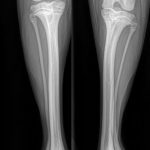 Clinical Case Challenge: More Than Hip Dysplasia? 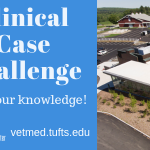 Clinical Case Challenge: Just Another Neurological Symptom?